Monday, Dec. 3, 2012, Jenner, CA. 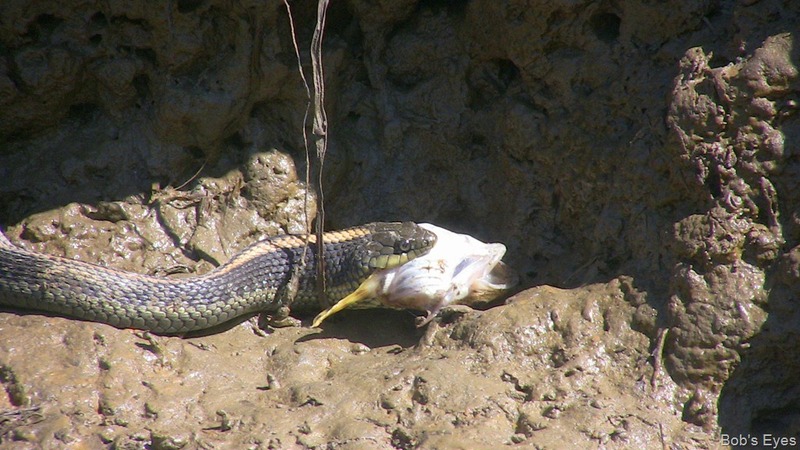 These snakes sure seem to be eating fish. Several years ago, I was sitting in my kayak in a little slot out of the wind at Jenner on the other side of Penny Island in the afternoon. It was a lazy day, so I was taking it easy, as usual, just sitting in one spot, observing with my eyes and ears, sometimes just with my ears as my eyes might shut for a bit. It was one of these moments that I heard something on the clay bank just to my right, only a few feet from me, as I opened my eyes, the picture below is what I saw. 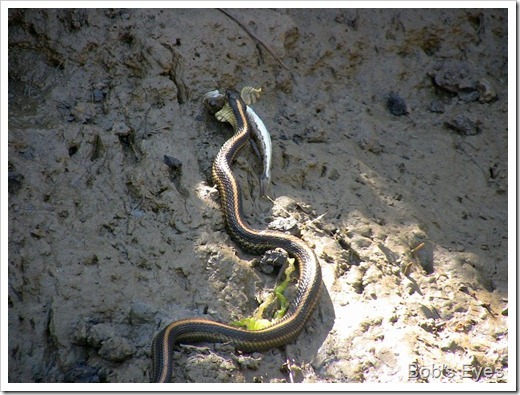 A snake had just come out of the water with a small fish it seemed to want to eat. Below, it is moving for a little cover, but there isn’t much to be had in this spot. 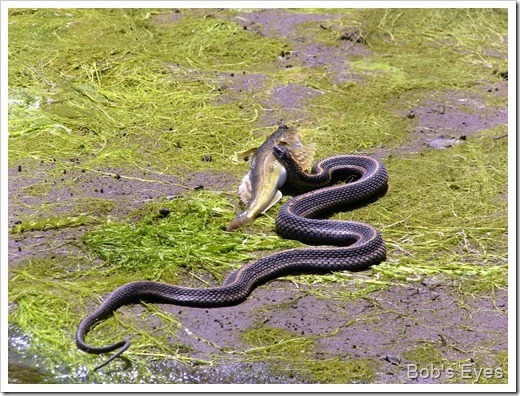 So, the snake preceded to swallow the fish, only one little problem. The problem can be seen in the picture below. 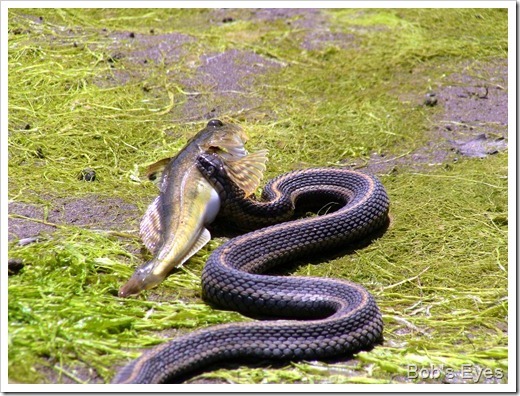 The snake can’t swallow the fish like this. I suppose, me being there was putting some pressure on the snake and it messed up. 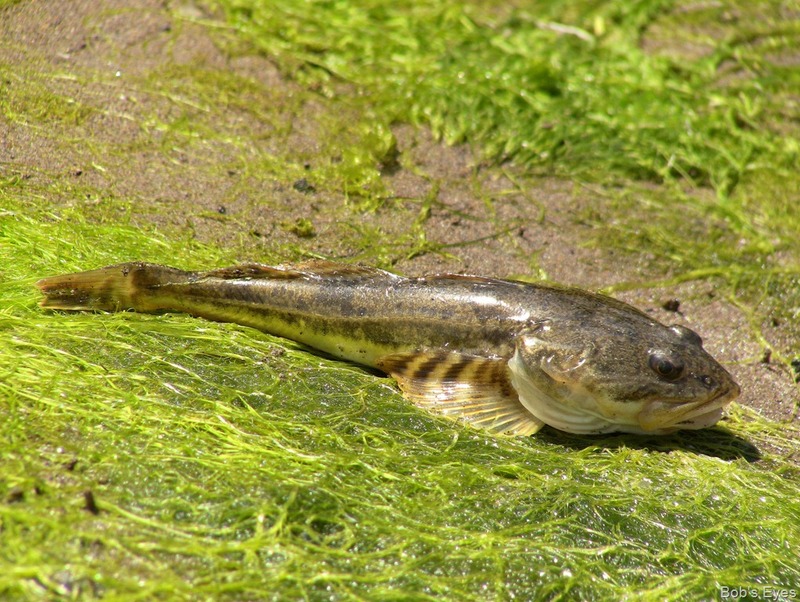 To eat one of these fish, it must be swallowed head first, so those side fins will go down. 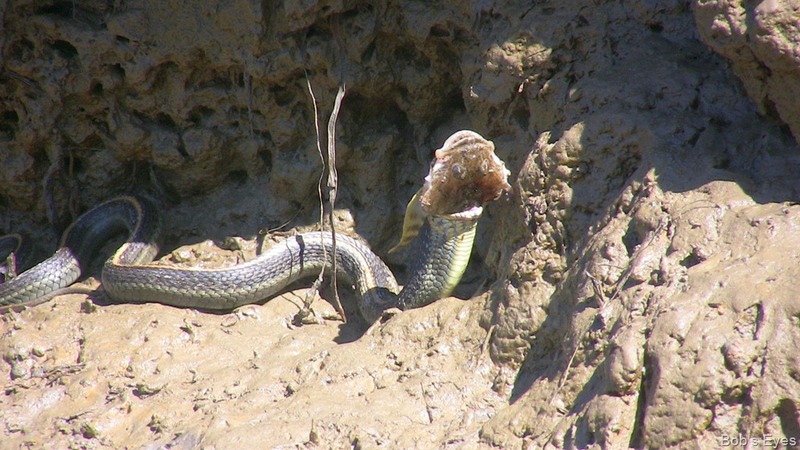 The snake finally spit it back up and turned it around and swallowed it while I watched. Something I thought of later. 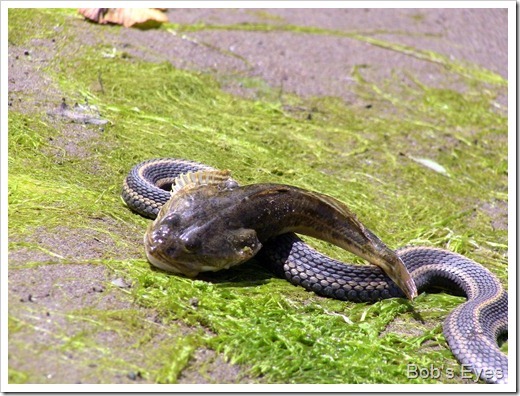 Maybe the snake swallowed it this way on purpose to protect it from something else that might want it? It seems like it would be easier to defend this way, than the other way with the fishes tail dangling out there in front for something to grab? Another day, I was cruising along the shore line, as I do a lot and spotted this thing, below,on the beach. 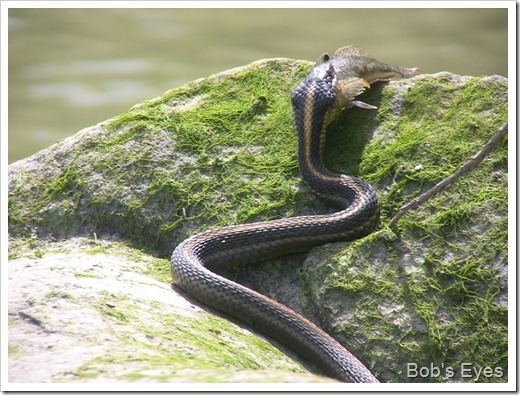 A garter type snake. It had just come out of the water with the fish. 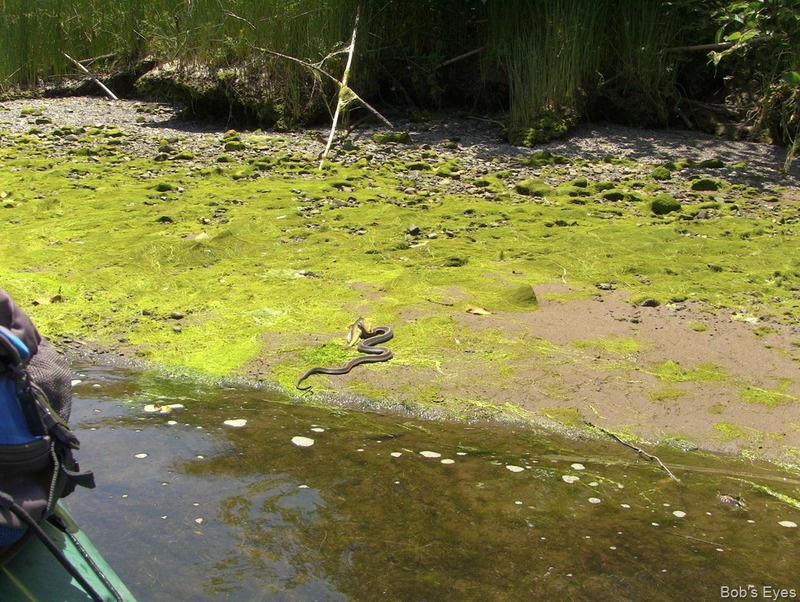 Below, the snake has a fish and just spotted me. I got about as close as I could and shot some pics of this snake. I liked the way it presses it’s body onto the ground, sorta flattened. 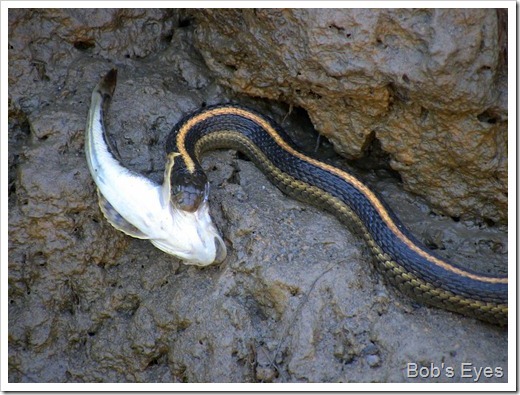 Below, you can see the snake has this fish fairly good. 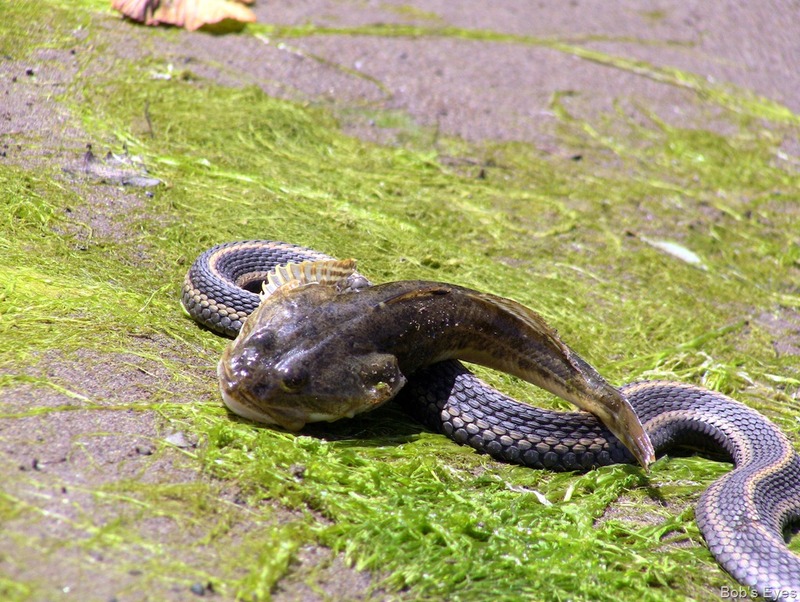 It had just come out of the water with it. I was scaring the snake a bit being that close, it was getting nervous. 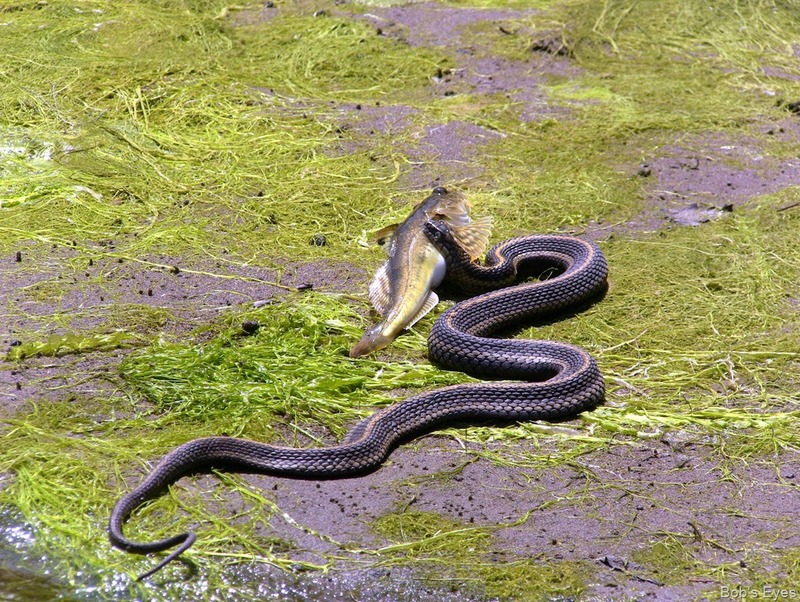 It let the fish go and slithered up away from the water toward the bushes and disappeared. 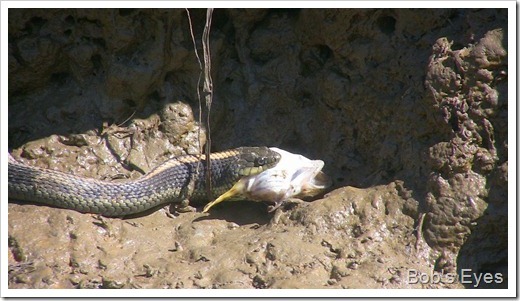 It was also a rather large fish for the snake to be swallowing, which might have something to do with why it let it go. 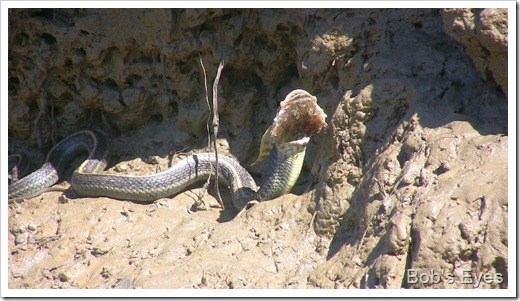 Snakes can swallow some rather large things though? Meantime the fish came to life and eventually flopped back into the water. I’ve heard these are little scalpin, but am not sure or of the spelling either. 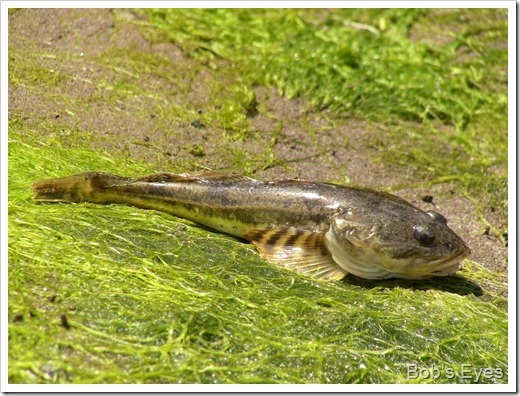 :O) As kids, we called anything that looked like this a bullhead. 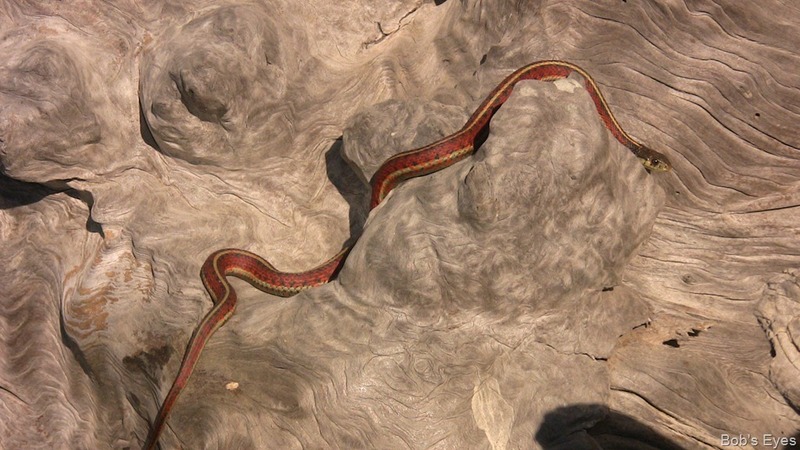 That same day, I spied this one out on a rock, not too far from the last one. 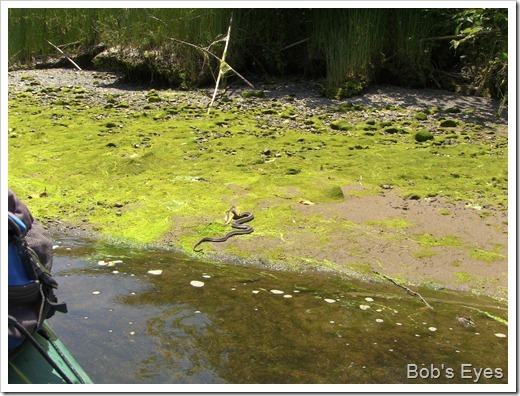 I saw a total of three snakes with fish along the water and one out in the bush that day. Must have been a convention going on. That was sometime in the spring, I believe. 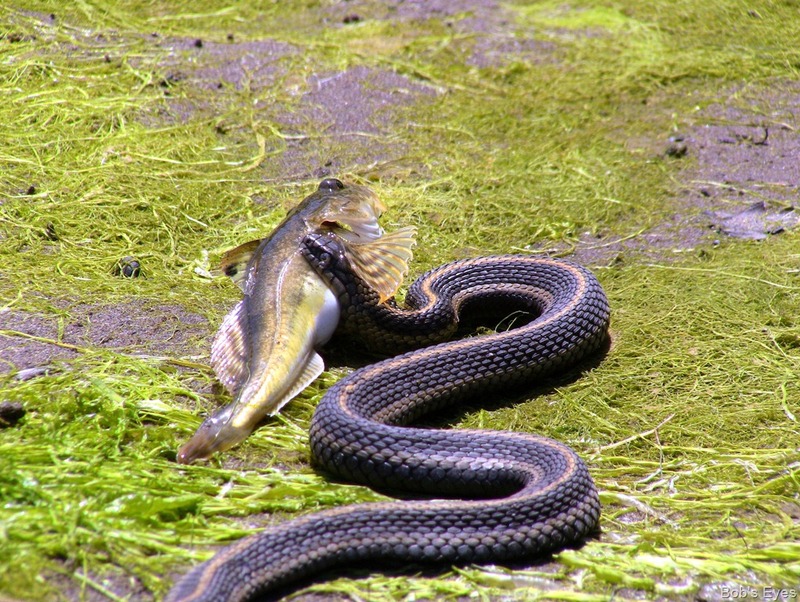 The snake below really has that fish good and in the right direction for swallowing too. 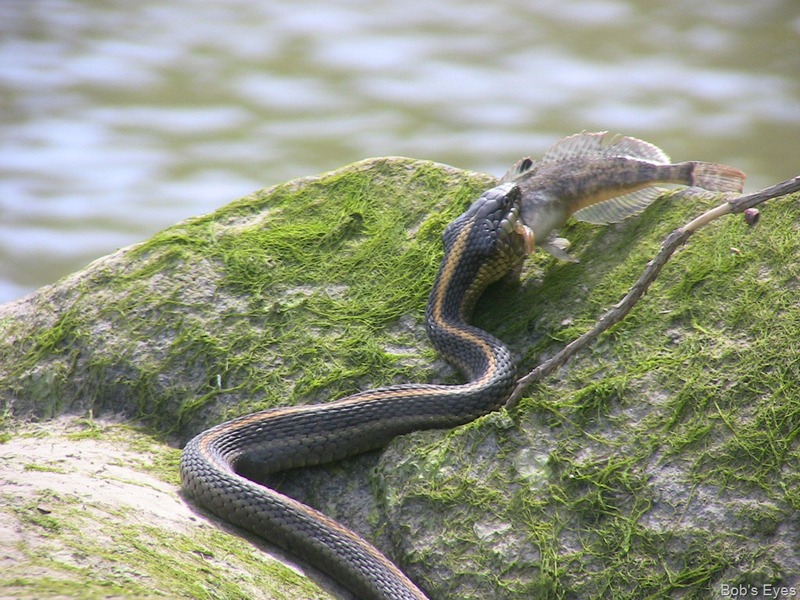 The fish flopped back and forth a little, then the snake swallowed it and I paddled off, leaving it at peace on the rock. 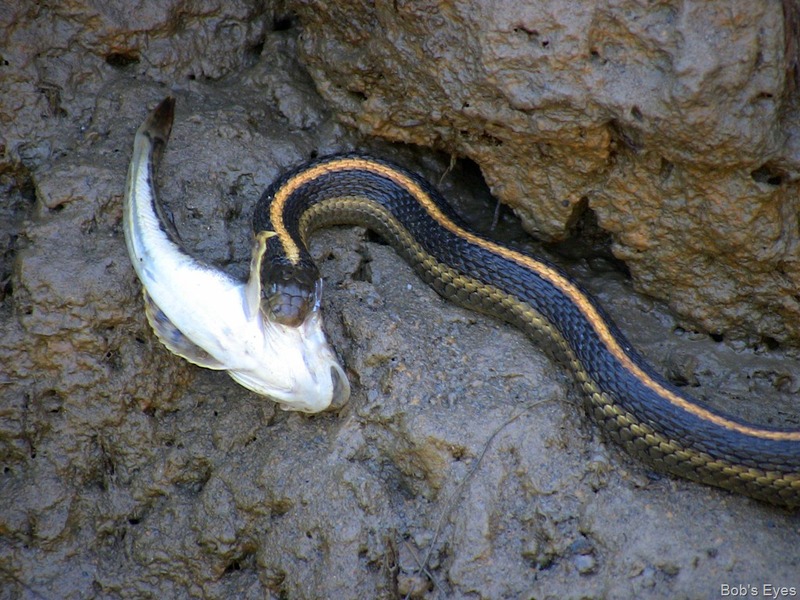 Although, the Garter snake below isn’t eating a fish, I thought it was a nice photo. This was taken on the west end of Penny Island a couple years ago. It’s resting in the sun on a big redwood burled stump that the river and weather has polished nicely. 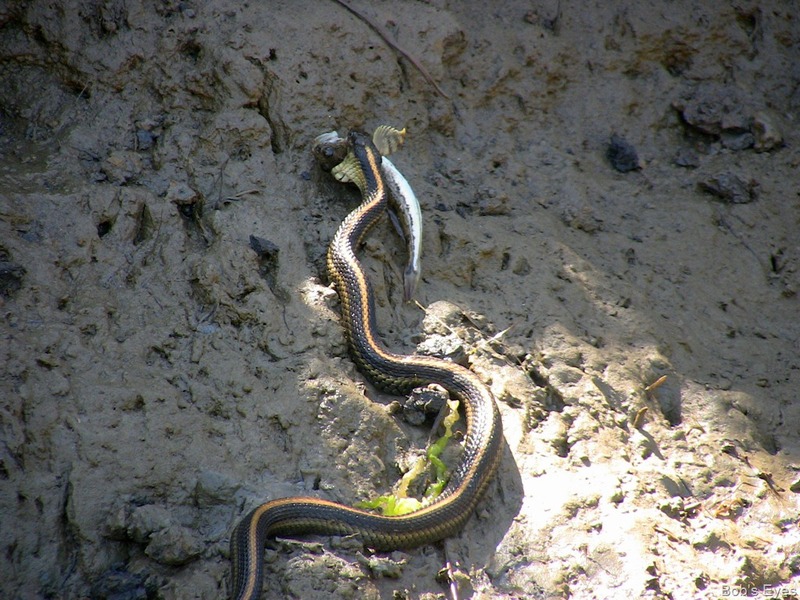 I think these are all different colored Garter snakes, but don’t quote me? 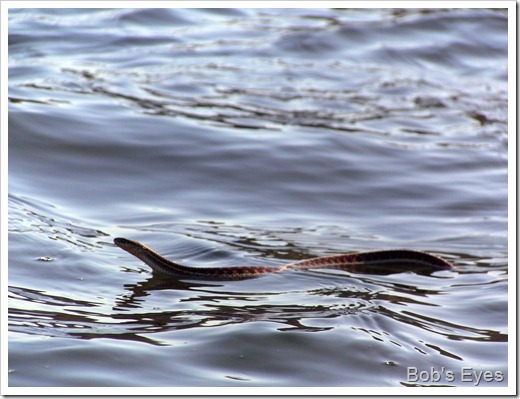 And lastly, this snake, a little brown snake. 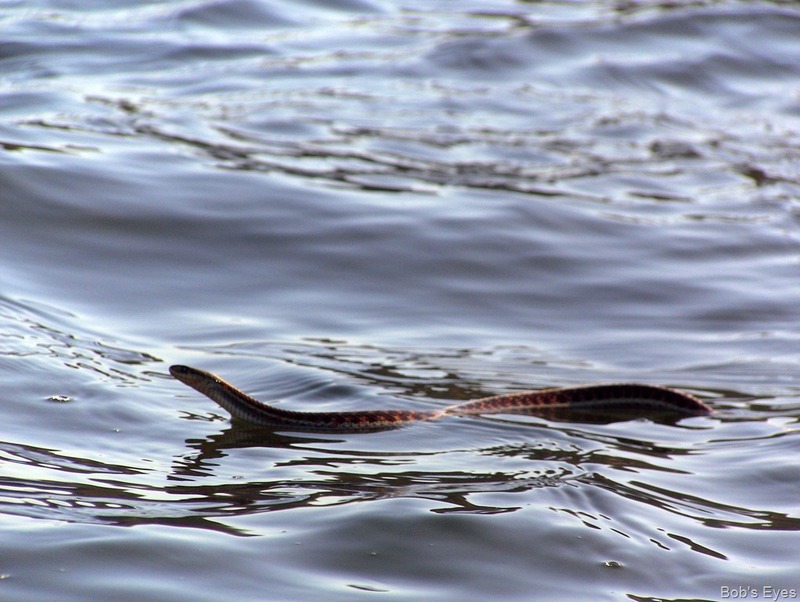 I saw it swimming way out in the middle of the river, just below the restaurant down there. I took it’s picture and turned to put my camera away. 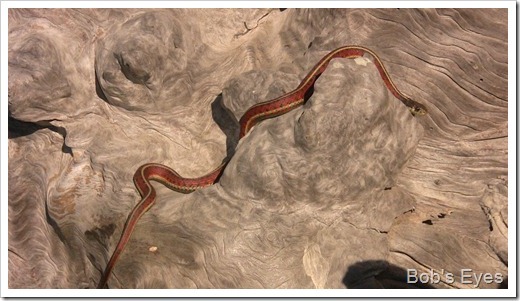 A couple weeks ago I was thinking of this snake and it dawned on me that the snake had pulled it off perfectly. I bet it was just playing dead and it worked quite well on me. I mean, it just couldn’t of died that quick to my thinking. 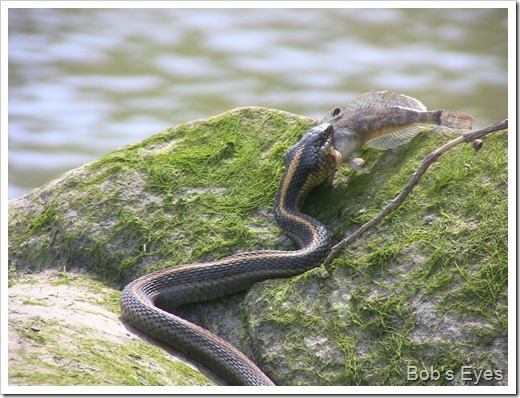 However, if it did that to a seagull or many of the other critters down there, it would just be another thing to eat. Maybe it has different ways to deal with different critters? 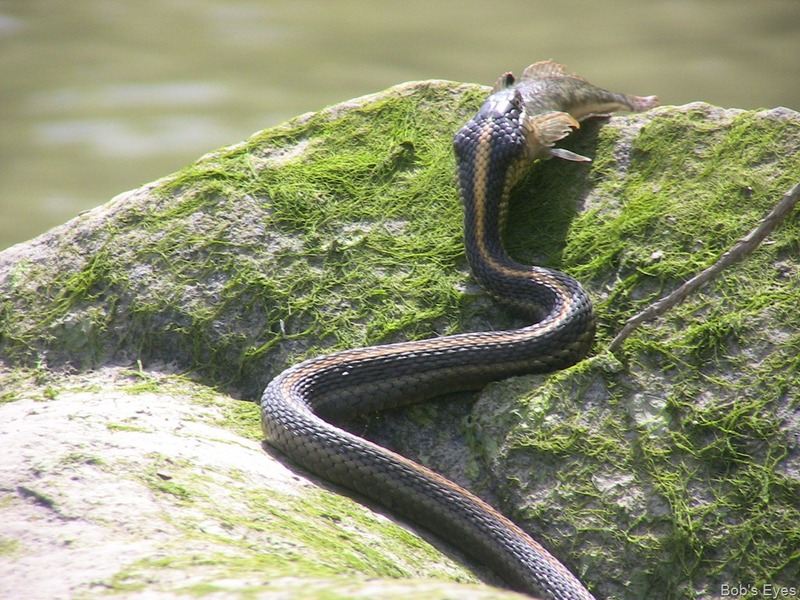 So far, I’ve only seen these types of snakes eating this type of fish, likely because they are fairly easy pray as they sit on the bottom motionless a lot of the time, easy for a snake to pick up. That’s it for snakes for now. I’ve been working on my van injector installation the last couple days. Yesterday, I constructed throttle linkage to my new injector, which I made out of some throttle linkage from an old Subaru I have parked out here for parts. Sure am glad I keep that car for parts as I’ve used stuff off it to make things quite a few times. Anyway, a little more tuning and that should be in shape. I also worked on hooking up the sensors for the new system and installed the main wire harness that hooks the new computer system together. I still have a bit to do on that. I was a bit slow getting started today as I needed to wait for the sun to come around some big redwood trees, but it finally did. My task today was to drop the gas tank and hook up the gas line return which was on the top of the tank and also put a new vent line in the tank, as these old tank had vents in the caps, but I needed something better that wouldn’t let gas out when I was on a slope with a full tank. But first, I redid the temperature sensors from the day before and worked on laying out the harness better. I redid the relay mount bracket I make a few days ago so it was in a better place. Then, I jacked the back of the van up and put it on work stands and took off the rear tires to make it easier to work on. Off with the fuel tank filling tubes and pipes and disconnect the fuel output and plug to keep the gas in. I then let the tank down with the jack, just enough to get to the vent pipes on the top to install a gas return line. Only trouble was, there was about a half inch of dirt and dust and little sticks and who knows what on top of the gas tank I had to clean up and it was a bit messy. Who knows what might sprout out of that dirt, likely some desert type thing. So, anyway, I got it all back together and braised a vent tube for a hose onto the tank vent on the filler pipe, which I can run up into the wheel well to get a bit higher to keep gas from coming out. It was getting dark, but I worked on rerouting the main wire harness a bit and figuring out what I need to finish the air filter system. I hope to get the rest of the parts for the air system tomorrow as I’m headed out to do some shopping, after I help a lady friend find some leaks in her wall in the garage. Another nice day around here, just working in the yard.